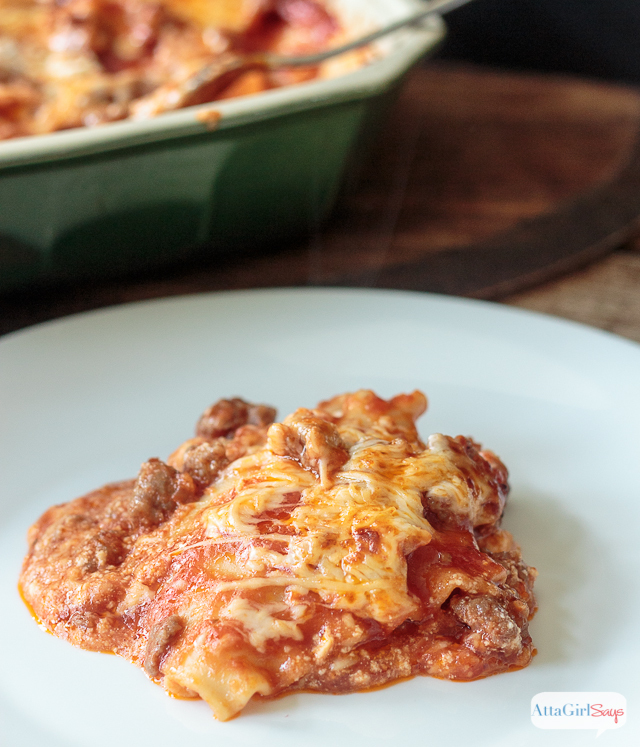 This homemade lasagna recipe, made with sausage and lots of ooey-gooey cheese is a family favorite. This quick-and-easy dish is perfect for family dinners, potlucks and weeknight meals. 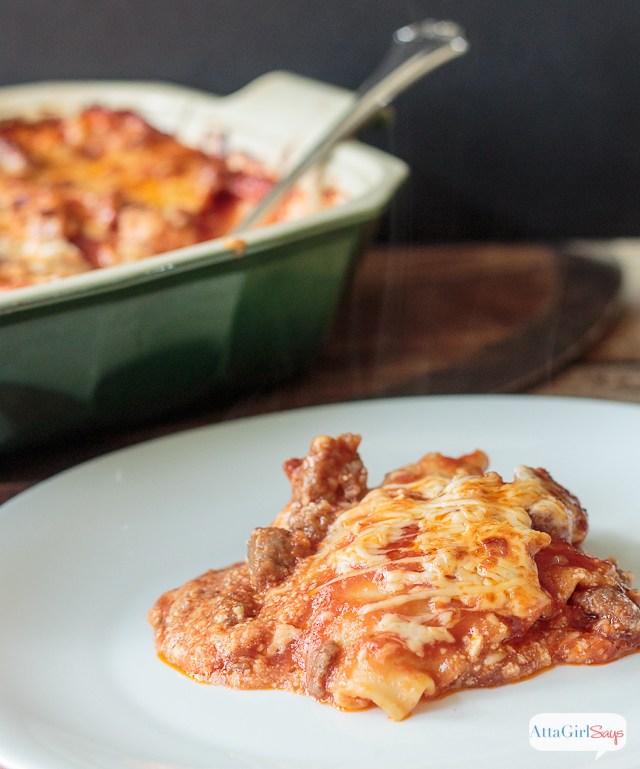 This homemade lasagna recipe is so good that I said “I do!” after trying it. Have I ever told you our proposal story? I know I’ve shared our love story and a little bit about our first date, but I don’t think I’ve shared what happened that night my husband asked me to be his wife. I kinda thought something was up when Bruce, whose bachelor meals consisted mainly of microwaveable foods, takeout or sandwiches, invited me over for a home-cooked meal. We had been dating for more than a year, and he actually seemed kinda nervous when he asked me over. Women kinda know these things, don’t we? I’m pretty sure I dressed up just a bit, and I might have gotten my nails done, just in case! But I didn’t share my suspicions with anyone. I arrived to find the table all set, and the smells of his homemade lasagna bubbling in the oven. Bruce waited until after we’d had our dinner to pop the question. That was 13 years ago before people filmed proposals to share on social media, so we’re both a little fuzzy on the exact sequence of events. Was it before dessert? Or after dessert? Did we even eat dessert? We two old married folks can’t remember! But I do remember that he had hidden the ring in a silver fortune cookie. And he got down on one knee and said a bunch of sweet things. And I said yes. I’m pretty sure the lasagna had something to do with it! 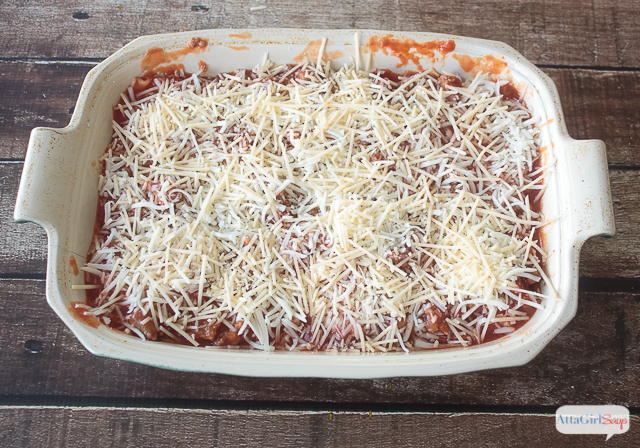 While I”ve shared this homemade lasagna recipe previously in a guest post at Made From Pinterest, I figured it was high-time to share it here, as well. Bruce’s lasagna is still one of my favorite meals — and not just because I don’t have to cook it. 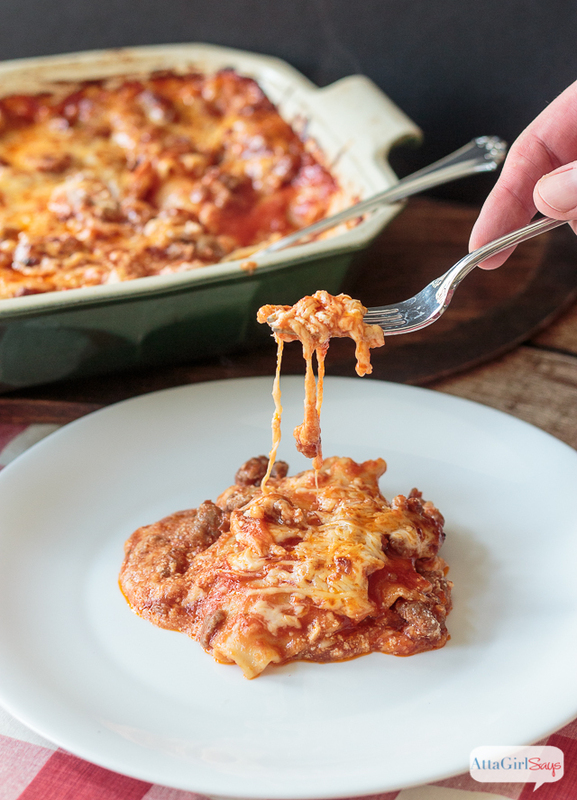 This lasagna is just how we like it — moist, a tad bit spicy and a tad bit sweet and oozing with three different kinds of cheese. It’s also made with love. I didn’t know this until recently, but apparently my husband did a test run and made a batch of this lasagna ahead of time before he invited me over for the big pop-the-question night. He wanted to make sure the recipe was a winner before he served it to me. I said, “Yes” when he proposed, so it’s safe to say the lasagna was a hit. Everyone who we’ve served it to since has raved about how good it is. And while it’s a for a from-scratch recipe, it’s really easy to put together. … and lots and lots of cheese. Boil lasagna noodles per instructions on the box. Drain when cooked. Brown Italian sausage in olive oil on medium heat. When sausage is completely cooked, add tomato sauce, garlic powder, oregano and sugar. Stir, then simmer for 5 minutes, or until sauce is bubbling. 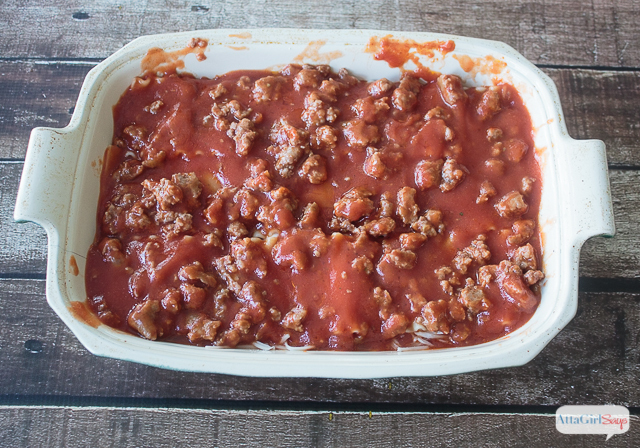 Spoon a generous layer of cooked sauce into a 9”X12” baking pan. 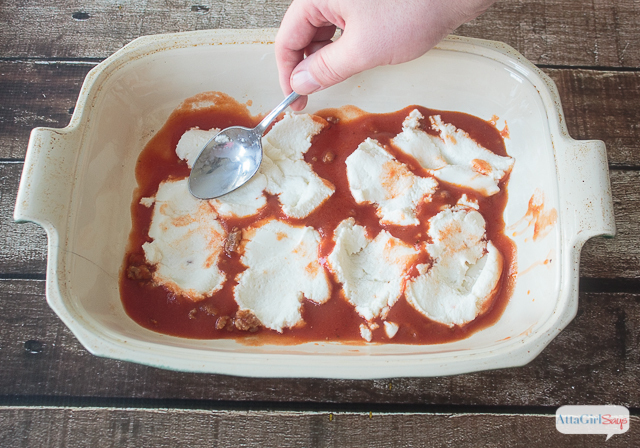 Spoon in half the ricotta cheese, then layer on 3 lasagna noodles. Add another layer of sauce, the rest of the ricotta and half of the mozzarella. Top with the remaining noodles. Add the rest of the sauce, then top with the remaining mozzarella and parmesan cheeses. 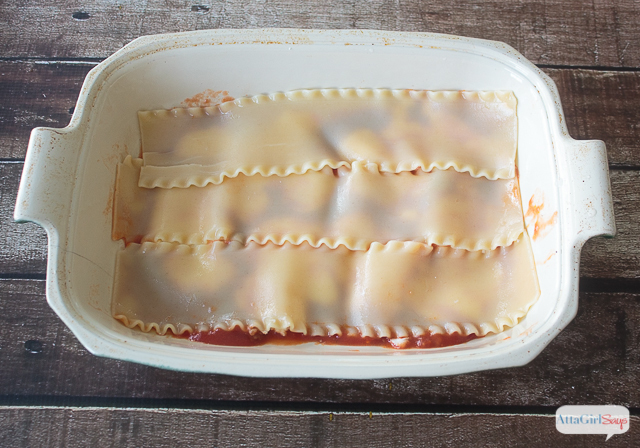 Cover lasagna pan with aluminum foil for baking. Bake covered pan at 350 degrees for 45 min.-1 hour, or until cheese is completely melted and bubbling. You may want to remove the foil during the last 10-15 minutes of baking to allow the cheese to brown. My hubby is a lot of things, but he’s not a very confident or experienced cook. He has about three or four recipes he makes on a regular basis. This is one of them. And it turns out perfect every time. He’s made it for many Sunday suppers and family gatherings. Once, he even cooked up a batch for my blogging girlfriends and I after a marathon shopping day. I told you he was a keeper. And so is this recipe. Yummy! Love the story. I was also late to mine, Joe was freaking out saying, “WHY are you flossing your teeth”, haha. Aw…I’m getting a little misty-eyed at reading this. I’ve said this many times, but proposing to Amy was the best decision I ever made. I’m just glad the lasagna worked! YUM!!!! Sounds wonderful with the sausage. I can’t have sugar. Would this taste okay without it? You can definitely omit the sugar. We just add it to counteract some of the acidity from the tomatoes, but it’s not necessary. I’ve never tried it with this recipe. But I have in the past used a small amount balsamic vinegar in a tomato sauce to give a little sweetness and tone down the acidity. I would start with a tablespoon, then add more to taste. Here’s a YouTube video I found that talks more about adding balsamic to a tomato sauce: https://www.youtube.com/watch?v=1FKOjWpzKqY. When I’ve done that with a meat spaghetti sauce, it really did give a new dimension of flavor. If you try it with the lasagna, let me know how it turns out. Looks like a good one. Love a new recipe for an old standby. This is on my list to try. Sharks for sharing.